In order to understand the historical perspective and the importance of combatives, we need to place it into its proper context. Goshinjutsu means self-defense or techniques to be used in a real fight. We define a "real fight" as a violent personal assault where your life is at risk. We define real fight technique as the following: Will this technique work, against a bigger, stronger, and faster opponent; who is determined to prevent it by any means, fair or foul! If the answer is yes the technique is probably a Goshinjutsu, or real fight technique. If not, then it has no value, or place in the system. Simply put, a jump spin back kick in most cases is not a real fight technique. This way of true combatives (budo) means that this system is your path in life. This Do is to allow you to pursue your life as a free man or woman. There is no freedom greater than your freedom from fear. It can be argued that the only true purpose of Government is to protect us, however, this is an impossible task, save for total loss of personal freedoms. Despite all of Governments efforts, we live with the daily fear of assault, fear of others taking your property, fear of the loss of life or liberty, and on and on. Today, as in Okinawa, you must look to yourself for the freedom from these fears. Our way, or Do, grants that freedom. When used in combination, the term Go-Shinjutsu means self-defense, or self-protection. Adding a term after makes a specific form of self-defense. Kodokan Go-Shinjutsu means the Kodokan system of self-defense. Shotokan Go-Shinjutsu, Ninpo Go-Shinjutsu, etc., all refer to a specific systems self-defense techniques. Go-Ju Shinjutsu, means Hard and Soft real fight techniques", or more correctly the total techniques of self-defense. The term Go, is usually defined as hard. Ju is usually defined as soft. These terms are far too simplistic for our needs. A better definition would be positive for Go, and passive for Ju, although not strictly true (Judo has strikes in it for example); The term Go in our definition will mean the striking portion (usually known as karate), and Ju will represent the grappling portion (usually known as Judo, Jujitsu or Aikido) of the system. Its interesting that all Japanese systems use the term Go-Shinjutsu to refer to self-defense techniques. This shows that they ALL know that effective self-defense is at the heart of their systems. How sad that most of them haven't a clue what effective techniques are any more. Keep in mind that the Chinese occupied Okinawa six months out of the year, and the Japanese occupied it the other six months. Because of this usage as a central port, the Okinawans were exposed to a wide variety of fighting techniques and systems. Because they were oppressed by both sides, it was in their best interest to uncover, discover, categorize, and master the best of those techniques. It stands to reason that we should learn and master those techniques as well! Its easy to see how ALL martial arts have chosen a few techniques from this list to create various systems. But FEW can claim a comprehensive a training program. As you will see, ANY technique you can think of, or learned, can be categorized and placed into this system. Keep in mind however, for true combatives, only techniques that fit into the heart (Will this technique work, against a bigger, stronger, and faster opponent; who is determined to prevent it by any means, fair or foul! ), should be learned and placed. Original Go-Ju Shinjutsu insisted on hard makiwara training, for both hands, feet, arms, and even the head. The people of Okinawa were forbidden to own weapons. They could find themselves in a life and death struggle on a daily basis. The ability to destroy an opponent with a single blow was a vitally important skill. The silent kill was perfected because the people of Okinawa were an occupied people, and their system was being used to protect them from their oppressors. The Japanese quickly realized the effectiveness of these techniques, and added them to their various Jujutsu styles. But the point is this; The risks of hard makiwara training far outweigh the advantages it may have. Frankly, I think you would be hard pressed in court to prove you weren't looking for a chance to use your skills when the jury gets a look at your hands. We have found a powerful hand (strength training), and development of iron palm (through slow, proper training), to be better suited for today's needs. We now need to look at the concept of WA. This word doesn't translate well into English. Blending, fitting, unity, etc., all relate to WA. Look at it like this; if we want the result to be 10, and you have 6, then you need 4 to get 10. However if you have 9 you only need 1; -4 you need 14 and so on. This means we feel where our opponent is, and apply the technique to put him where we want him to be. How hard we pull or push, where and how we strike, what techniques we use, are all selected by the principle of WA. By using the above list, and looking at the preceding chart, you can find the location of techniques you need for each level of attack. Keep in mind that we live in a different age than the originators of combstives. Our needs are the same but our attackers are not. We must learn how to apply these techniques in a rapidly changing world. We teach must the traditional techniques with a modern coaching attitude; with an eye to the legal and moral results of our actions. It is important for you to understand the various techniques that make up true combatives. As a general rule, if we are not touching our opponent we use GO or positive techniques (striking). If our opponent is touching us we use JU or passive techniques (grappling). We always attempt to use evasive footwork to avoid our opponents movements, and hopefully the assault all together (see the 4 rules). This is the first part of the O-waza called Evasions or Kamae. Because a person cannot think of two different things at the same time; and because a person will go to great lengths to prevent personal injury (people on drugs are an exception to this); we want to distract our opponent from his plan by hitting him. This blow in itself may end the fight, and if so good. However the purpose of the blow is to stop his actions. This is called Atemi-waza. Next we want to prevent any continued attacks by this person. Keep in mind the way we prevent this is based on the type of attack and the legal boundaries of the place you're at. Generally we want to control the person at this time, (in a life and death struggle we would use a stronger atemi or joint attack, not a control! ), with a joint lock, called Kansetsu-waza. If the opponent fails to submit, or we are unable to control them for long, we now will strike them with a much harder blow. We can show in court we attempted to restrain this person and they kept trying to injure us. This Atemi is usually to the leg with the idea of taking away the ability to move/ballance by breaking the base. Even if the person isn't knocked down by this move, they will be set up for the next. At this point, if the opponent is still trying to hurt us, and we cannot escape, we will throw them to the ground. This is called Nage-waza. We will then restrain them, called Oasae-waza. As a last resort, we will set a finishing hold, (either a strong joint lock or a choke). The Choking techniques are called Shime Waza. The joint locks are called Kansetsu Waza. The above should go a long way to helping you understand the O-waza. Great stuff Coach, We all appreciate it!! 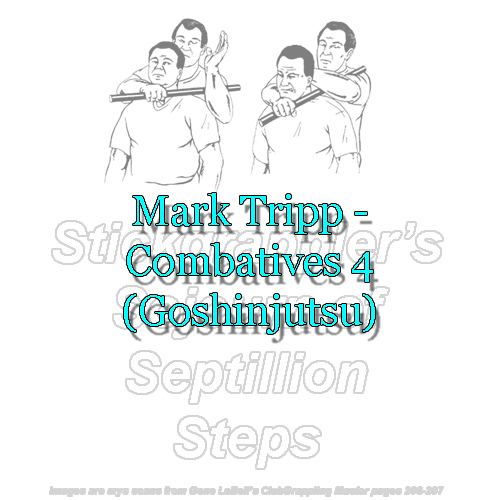 NOTE: Posted as-of May 24, 2000 on Nov 22, 2013 to mirror my old archives - http://stickgrappler.tripod.com/ug/mtcombat4.html.